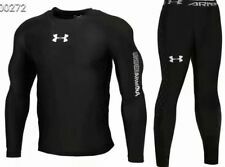 UNDER ARMOUR BASE LAYER MENS COLDGEAR THERMAL FITTED STRETCH MOCK "NEW 2019"
mens black under armour compression leggings size 2XL. Condition is Used. Dispatched with Royal Mail 2nd Class. Flat, contoured seams to reduce friction. Flat stretch fabric for wearing comfort and a perfect fit. 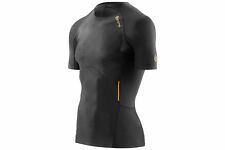 Dri-Fit material leads sweat out provides dry wearing comfort. Very good condition - rarely worn. I am 6ft, 86kg (13.5 stone) with ~45" Chest & ~33" Waist - too small (although feels great on). I am 6ft, 86kg (13.5 stone) with ~45" Chest & ~33" Waist and the compression good for either lighter or slightly heavier builds than mine. I am 6ft, 86kg (13.5 stone) with 45" Chest and 33" Waist and great light compression fit. Ideal for similar & lighterbuilds. We specialise in the sale of affordable new golf balls and lake golf balls. Other deals available include a wide range of clearance apparel, footwear and accessories. galvin green. High quality products at amazing prices. Model : MA4478B. 2XU Accelerate Compression Shorts. These 2XU Accelerate Compression shorts are light weight and designed to reduce muscle fatigue. Style : Accelerate Compression. These compression shorts are such a classic designed masterpiece! Under armour Black compression leggings size small. RRP £43.99. Condition is Used. Dispatched with Royal Mail 1st Class.